Congratulations on your upcoming marriage in the Catholic Church. In an effort to help you prepare for one of the most important steps in your lives, the Catholic Church has established a policy which applies to all Catholics in the Archdiocese of ST. Louis and in the other three dioceses in the State of Missouri. Your parish priest or deacon is the key person as your prepare for the Sacrament of Matrimony. Marriage, by its very nature, is a most serious and sacred commitment. It is also the basic unit of society and the Church. Therefore, it deserves the most careful attention and preparation. For this reason, the parish priest or deacon will assist you as you prepare for your marriage. Our goal is not to make your entry into marriage more difficult, but to enhance your relationship by assuring that an appropriate preparation has taken place. The following information, hopefully, will answer some of the questions you may have concerning the wedding ceremony and, at the same time, highlight the sacred nature of your sacramental marriage in the Church. If you desire to be married at St. John the Baptist Catholic Church, one of you must be a registered members of the parish. A baptized Catholic should always reside in the geographic boundary of the parish, even if he or she is not registered. The priest of the parish you reside in is responsible for your spiritual welfare. Therefore, if you are not registered in your parish, please do so as soon as possible. If neither of you reside in St. John the Baptist Catholic Parish, you must contact your parish priest to make arrangements for the wedding. We do not “rent” out the church. Nor to we actively seek weddings from outside the parish. We gladly allow the use of St. John’s Church, but your priest is responsible for your preparations and must agree to witness the ceremony. 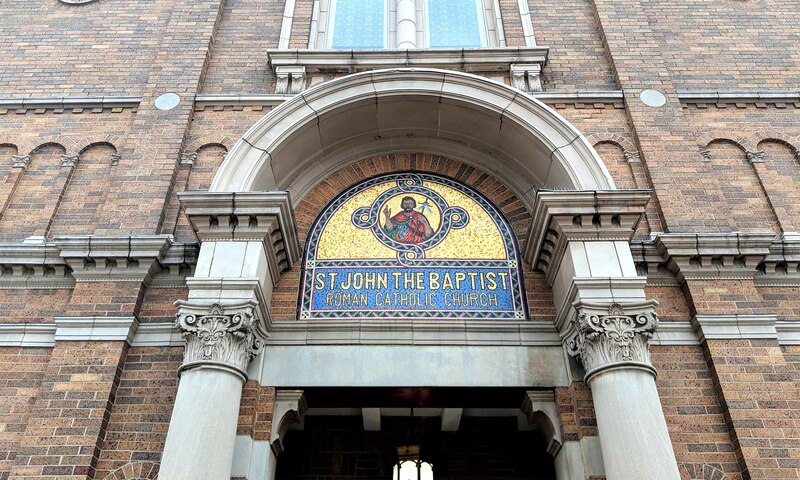 Couples not registered in the parish should contact St. John the Baptist Rectory at 314-353-1255 to obtain forms titled Agreement of the Officiating Priest (completed by the priest/deacon who is going to be responsible for your preparation and ceremony) and the Request for Marriage form. Please return these forms to St. John’s at least six months prior to your wedding date. No dates will be reserved until forms are received. Following the forms being received and date confirmed with the Rectory, you will need to arrange an appointment with the priest/deacon to begin the marriage preparation. Read more about marriage preparation here. Those seeking to be married in the Catholic Church are expected to be practicing their faith. It is good custom to seek out the Sacrament of Reconciliation (Confession) at the beginning of the preparation period and once just again prior to the marriage, so you feel spiritually prepared to receive the Sacrament of Matrimony. If either party has been previously married, an annulment from the Catholic Church may be necessary. The priest or deacon preparing you for marriage will help you with any necessary paperwork. Please note: a date for your wedding may not be scheduled until the annulment process is completed.